This movie is an upcoming remake of the 1941 classic. 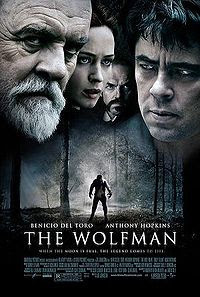 Directed by Joe Johnston and stars Benicio del Toro, Anthony Hopkins, Emily Blunt, Hugo Weaving and Geraldine Chaplin. I don’t want to give away too mach of the story but here is the plot: Upon his return to his ancestral homeland, an American man (Del Toro) is bitten, and subsequently cursed by, a werewolf. I’m always up for a scary Wolf/vampire movie,plus my BF just love loves them as well so I score some points on this front.